We saddled up after the moon came up and made a little peaser out west and north. Checked on a couple tanks and had a nice moonlight ride. Windy and warm, but a nice ride. Not many get to do that. Got up over 100 today. Kelvin and I rode down south to the next door neighboring pasture and failed in our attempt to bring back a strayed heifer. Dumb little rip wouldn’t drive lead or drag worth a darn. Perhaps with the right application of some braided kangaroo hide tomorrow we will change her mind and attitude. We decided it was going to get too hot to do much else so we went to Rapid and went on a shopping trip. Money was left in that fair city and also in Spearfish where we went in search of banded collar shirts for Kelvin. I got a new chain on the chainsaw and left the old one for sharpening. I got a pair of fairly cheap priced Ariat boots as Cindy has been after me forever to try a pair. We shall now see…. the reproduction saddle that is. It is setting in the yard, letting oil soak in. we used some stain on it to try and make it look older. It does, from a distance, but not so much, up close. Wish I had thought and bought some antique stain for it when I was in town the other day… oh well, I am sure it will be fine. 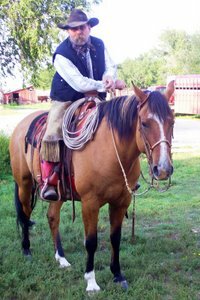 Saddled up this morning after working in the leather shop for awhile and we went for a nice ride.Let the cows into fresh pasture, tho’ not all that much extra feed there…. found a bull who needs more vaccine for fot rot…and just had a pretty nice ride. Neighbor called and we start fall works on calves next Tuesday…Kelvin will enjoy that as it’s a pretty big rough pasture to gather. I worked on the reproduction saddle and Kelvin helped me. Cold is hanging in there….but no hives for several days. Got a new little Heritage Arms Birds head grip pistol in town the other day so Cindy and Kelvin and I shot targets last night. Pretty nice little gun. Real nice day, not too hot and just a nice breeze. Supposed to warm back up now. As I picked up Kelvin, my Danish friend from the airport last night. Y cold kicked back in yesterday evening as I went5 a bit short of sleep night before last. Was up until midnight watching and responding to a small grass fire with Delbert and the Truck from Red Owl. They had it out by the time we got there, but we stayed as they mopped up, kept up a drizzle and we got wet and came home. When I went to bed I was cold and couldn’t sleep, so moved into the other room so as not to disturb Cindy. Felt good yesterday morning for awhile and then got real sleepy so took a nap. Awoke rested and refreshed and felt better than I have for a long time. Good drugs! But by last night, I was running down. Did a lot of running in Rapid getting things we will need to take with us to the upcoming Artist Ride. Coughed a lot in the night and will need a nap at some point today. Laramie is supposed to come and shoe up the front feet on some horses this afternoon. Windy and cooler today. Now off to other project. But because of Kelvin being here and the Artist Ride, I may not post quite as often…. Must be the rosin weed…. Or Curlycup Gumweed if you prefer. Nasty little weed that even the grasshoppers won’t eat. Not sure what it’s good for, but it must be what is causing my allergies to kick in. Up last night and the night before, itching and scratching. Took some anti itching pills and eventually went back to sleep for awhile. This morning I got an appointment with a nice lady doctor in Sturgis and I think she is going to make it bearable. Got several different pills I will be (and am) taking and basically just more of them than I normally would. This afternoon, Delbert dropped off his dart gun and some med for a foot sore bull. Fr Tyler and Cindy went with me to see me use it. Worked well. guess i will have to invest in one, tho’ I am sure Delbert would be willing to rent his for a reasonable fee. Got a new tree in the other day and skeleton rigged it and been riding it on Charlie. It is full Quarter horse bars which means they are a bit wider and flatter at the front so as to fit them no to low withered horses. Charlie is going well, didn’t even try to buck the last couple ride. And got him to walk home after the horses which is quite a feat as gassy as he is. I go pick up Kelvin, my Danish friend, tomorrow at the airport. Then we will be busy! Got Laramie coming to shoe horse on Wednesday and I am, sure we will be ahorseback every day after Kelvin gets here. He came early so as to get in on the Artist Ride. I think I will ride some colts while I have him here to go along for my colts to follow a broke horse. 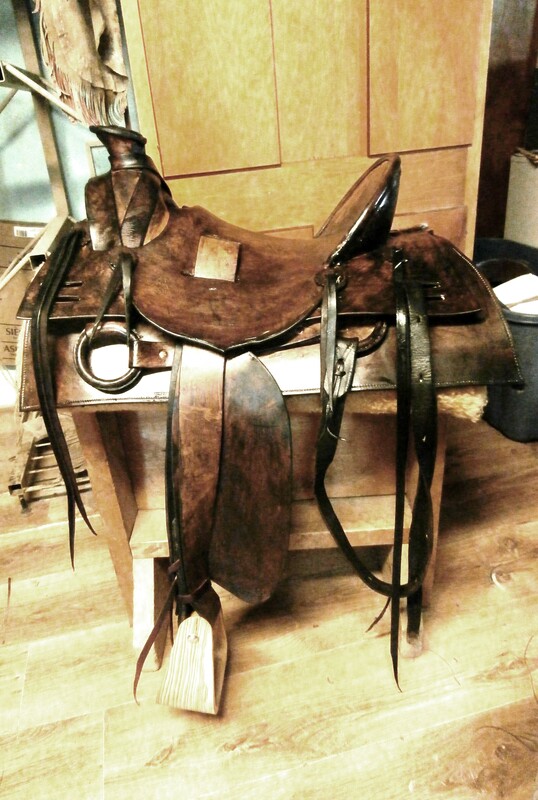 This new saddle, I worked on the cantle quite a bit and it really feels good. Talked to a tree maker about how the cantle on a bronc saddle is made and tried to mimic that and think I’ve got it pretty close. I’ve always been pretty happy with my ground seats, but wasn’t aware I could do this and make them feel so secure….cool! Supposed to get wind and cooler on Wednesday.Got an email with the picture that is supposed to go on the cover of the new Cd and man! It is way cool! Brenda has so much talent it’s scary!